This week as project managers from across the Pacific gather in Auckland for a professional development meeting on ‘Just Play’. The three-day meeting is taking place at OFC headquarters in Greenlane and aims to provide the participants with all the information they need to run the Just Play course successfully in their countries. Through funding support from the Australian Government, the meeting will benefit participants representing eight island nations, including Cook Islands, Fiji, Papua New Guinea, Samoa, Solomon Islands, Tahiti, Tonga and Vanuatu. OFC head of social responsibility Franck Castillo, who leads the Just Play project, says the meeting is a great opportunity for the project managers to increase their knowledge and understanding of Just Play, as well as share some of their experiences of the programme so far. The meeting was officially opened with a welcome speech from OFC General Secretary Tai Nicholas, who paid tribute to the hard work of the OFC Just Play staff and stressed the importance of the programme. “It is one that attracts a lot of credibility around the region and across the world,” he says. In addition to learning how to carry out the programme correctly, each of the participants will give a 30-minute presentation about the progress of Just Play in their countries and Castillo says other feedback will be encouraged throughout the three days. OFC staff offering their expertise during the meeting include Just Play consultant Vania Kenning, women’s development officer Emmie Sope and technical director Patrick Jacquemet. Sope has taken on the role of Just Play technical co-ordinator from Colin Tuaa, who will now focus primarily on elite development, and Castillo is delighted to have welcomed her on board. “I am proud to have a woman working in the team because we can’t promote gender equity if we have only men involved,” he says. ‘Just Play’ is a unique grassroots programme which promotes physical activity for primary-aged children while encouraging community involvement and healthy living. 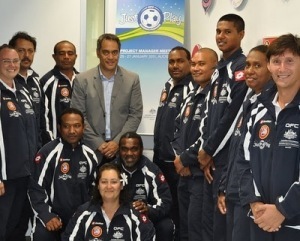 Developed by the OFC social responsibility and technical departments, Just Play was launched in Vanuatu last April and has since been introduced in Tonga, Samoa, Tahiti, Solomon Islands and South Auckland in New Zealand. 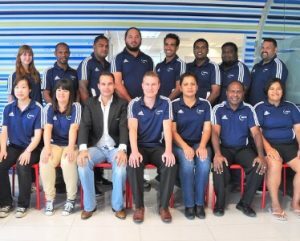 Next on the agenda are Fiji, Cook Islands and Papua New Guinea while OFC is also currently working in New Zealand with Special Olympics (NZ) on a Just Play programme for people with mental disabilities. 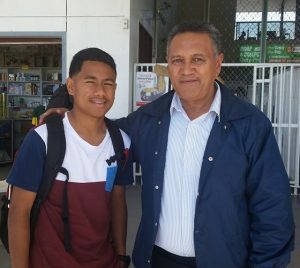 OFC is working closely with UEFA, the Government of Australia – through its agencies the Australian Agency for International Development (AusAID) and the Australian Sports Commission (ASC) – and Football Federation Australia (FFA) to roll out the programme across the Pacific. The Australian Government has shown its support to the project by contributing AU$4million. In South Auckland, Just Play is supported by OFC’s partnership with the Sir John Walker Find Your Field of Dreams Foundation, Counties Manukau Sport and Auckland Football Federation. Passionate in football open up to great opportunity!